Father Damien, formally Joseph de Veuster, ss.cc. 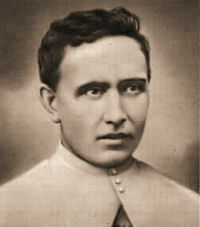 and St. Damien of Molokai (January 3, 1840 - April 15, 1889), was a missionary of the Congregation of the Sacred Hearts of Jesus and Mary who is revered primarily by Hawaii residents and Christians for having dedicated his life in service to the lepers of Molokai in the Kingdom of Hawaii. Father Damien is the spiritual patron of lepers, outcasts, and those with HIV/AIDS, and of the State of Hawaii. St. John of Avila, recently declared a Doctor of the Church. He was the Apostle of Andalusia and the spiritual advisor of St. Teresa, St. Francis Borgia, St. John of the Cross, St. Peter of Alcantara, and others. He was born on January 6, 1499, at Almodovar del Campo, Spain. After studying law at the University of Salamanca, he left the university to be a hermit. He then went to Alcala, where he was ordained. John drew great crowds with his fiery denunciations of evil and his many sermons. A brief imprisonment by the Inquisition inSeville made him even more popular. His missionary efforts were centered on Andalusia, and his letters and other writings have become Spanish classics. John was canonized in 1970. According to the 1962 Missal of Bl. John XXIII, the Extraordinary Form of the Roman Rite, today is also the feast of St. Antoninus, Bishop of Florence, and a member of the Dominican Order. In the exercise of his pastoral charge he showed great charity. He died in 1459. It is also the commemoration of Sts. Gordian and Epimachus. Gordian, a Roman judge, was converted by a holy priest whom Julian, the Apostate, would have liked him to condemn. He was martyred around 360 and was buried in the crypt where already laid the remains of the martyr St. Epimachus (250), brought from Alexandria. Joseph De Veuster, the future Father Damien, was born at Tremelo in Belgium, January 3rd, 1840. His was a large family and his father was a farmer-merchant. When his oldest brother entered the Congregation of the Sacred Hearts (called 'Picpus' after the street in Paris where its Generalate was located), his father planned that Joseph should take charge of the family business. Joseph, however, decided to become a religious. At the beginning of 1859 he entered the novitiate at Louvain, in the same house as his brother. There he took the name of Damien. In 1863, his brother who was to leave for the mission in the Hawaiian Islands, became ill. Since preparations for the voyage had already been made, Damien obtained permission from the Superior General to take his brother's place. He arrived in Honolulu on March 19th, 1864, where he was ordained to the priesthood the following May 21st. He immediately devoted himself, body and soul, to the difficult service of a "country missionary" on the island of Hawaii, the largest in the Hawaiian group. At that time, the Hawaiian Government decided on a very harsh measure aimed at stopping the spread of "leprosy," the deportation to the neighboring island of Molokai, of all those infected by what was thought to be an incurable disease. The entire mission was concerned about the abandoned "lepers" and the Bishop, Louis Maigret ss.cc., spoke to the priests about the problem. He did not want to send anyone "in the name of obedience," because he knew that such an order meant certain death. Four Brothers volunteered, they would take turns visiting and assisting the "lepers" in their distress. Damien was the first to leave on May 10th, 1873. At his own request and that of the lepers, he remained definitively on Molokai. He brought hope to this hell of despair. He became a source of consolation and encouragement for the lepers, their pastor, the doctor of their souls and of their bodies, without any distinction of race or religion. He gave a voice to the voiceless, he built a community where the joy of being together and openness to the love of God gave people new reasons for living. After Father Damien contracted the disease in 1885, he was able to identify completely with them: "We lepers." Father Damien was, above all, a witness of the love of God for His people. He got his strength from the Eucharist: "lt is at the foot of the altar that we find the strength we need in our isolation..." It is there that he found for himself and for others the support and the encouragement, the consolation and the hope, he could, with a deep faith, communicate to the lepers. All that made him "the happiest missionary in the world," a servant of God, and a servant of humanity. Having contracted "leprosy" himself, Fr. Damien died on April 15th, 1889, having served sixteen years among the lepers. His mortal remains were transferred in 1936 to Belgium where he was interred in the crypt of the church of the Congregation of Sacred Hearts at Louvain. His fame spread to the entire world. In 1938 the process for his beatification was introduced at Malines (Belgium): Pope Paul VI signed the Decree on the "heroicity of his virtues" on July 7th 1977. He was canonized on October 11th, 2009. In Father Damien, the Church proposes an example to all those who find sense for their life in the Gospel and who wish to bring the Good News to the poor of our time. Be adventurous and prepare a Hawaiian luau in honor of Bl. Damien. Saint John of Ávila was born in Almodóvar del Campo of a wealthy and pious family of Jewish converso descent. At the age of fourteen he was sent to the University of Salamanca to study law but returned after a year to his father's home, where he spent the next three years in the practice of austere piety. His sanctity impressed a Franciscan journeying through Almodóvar, on whose advice he took up the study of philosophy and theology at Alcalá de Henares, where he was fortunate to have as his teacher the famous Dominican Domingo de Soto. While he was a student his parents died and after his ordination he celebrated his first Mass in the church where they were buried, sold the family property and gave the proceeds to the poor. He saw in the severing of natural ties a vocation to foreign missionary work and prepared to go to Mexico. 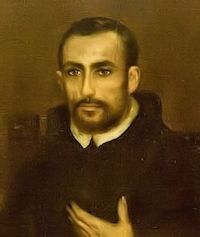 In 1527, while he was in Seville looking for a favorable opportunity to set out for his new field of labor, his unusually great devotion in celebrating Mass attracted the attention of Hernando de Contreras, a priest of Seville, who mentioned him to the archbishop and Inquisitor General, Don Alonso Manrique de Lara. The archbishop saw in the young missionary a powerful instrument to stir up the faith in Andalusia, and after considerable persuasion Juan was induced to abandon his journey to America. His first sermon was preached on 22 July 1529, and immediately established his reputation. During his nine years of missionary work in Andalusia, crowds packed the churches at all his sermons. However, his strong pleas for reform and the denunciation of the behavior of the high society brought him before the inquisitor at Seville. He was charged with exaggerating the dangers of wealth and with closing the gates of heaven to the rich. The charges were quickly refuted and he was declared innocent in 1533. By special invitation of the court he was appointed to preach the sermon on the next great feast in the church of San Salvador, in Seville. Like other Spanish mystics of the period, including La Beata de Piedrahita, he was suspected several times during his career of belonging to the Alumbrados, deemed a heretical sect. John of Avila is also remembered as a reformer of clerical life in Spain. He founded several colleges where his disciples dedicated themselves to the teaching of youths. Among the disciples attracted by his preaching and saintly reputation were Saint Teresa of Ávila, Saint John of God, Saint Francis Borgia and the Venerable Louis of Granada. Of special importance was the University of Baeza established in 1538 by a papal bull of Pope Paul III Its first rector was Saint John of Ávila and became a model for seminaries and for the schools of the Jesuits. He is especially revered by the Jesuits. Their development in Spain is attributed to his friendship and support to the Society of Jesus. St. John of Avila was declared Venerable by Pope Clement XIII on February 8, 1759 and beatified by Pope Leo XIII on November 15, 1893. On May 31, 1970 he was canonized by Pope Paul VI. Pope Benedict XVI named him a Doctor of the Church on October 7, 2012, the Feast of the Holy Rosary. To learn more about St. John of Avila read New Doctors of the Church: St. Hildegard, St. John of Avila, St John of Avila: Learning the Language of God, St. John of Avila's Life of Prayer and Who was John of Avila? . You may read the Letters of Blessed John of Avila at the open library. He wanted to join the Dominicans, but he was so small he scarcely reached above the tabletop in the office of Blessed John Dominici, the Dominican prior of Santa Maria Novella in Florence. To put him off, the prior told him to go home and memorize the Decrees of Gratian, a compilation of Church law. Within a year, the boy had returned, had committed the decrees to memory, and was given the habit of a Dominican. St. Antoninus was one of the first novices at Fiesole, which Blessed John had built, and among his fellow novices was the future artist Fra Angelico. After his ordination to the priesthood, Antoninus was made prior at Rome, Gaeta, Siena, Fiesole, and finally at Florence where he founded the famous Convento di San Marco, where Fra Angelico did some of his most memorable work. He was summoned by Pope Eugene IV to take part in the Council of Florence in 1438, and as prior of San Marco, welcomed many of the prelates and scholars to Florence for the sessions of the council that took place there. It was at this time also that the great library of San Marco was opened to the public. In 1446, much against his will, he was appointed archbishop of Florence but continued to live as a simple Dominican friar. Then, he became a veritable dynamo of activity: he rebuilt churches, visited parishes, preached incessantly, and brought about peace between political factions and religious orders. He was in Rome at the deathbed of Pope Eugene IV and was consulted by succeeding pontiffs in the reform of the papal curia. He was a superb theologian, his writings on moral theology and economics are considered pioneer works in the changing society of his times. Shortly before the death of Antoninus, a plague hit Florence, decimating the city, with many of his friars dying, and the people starving from famine. He sold everything to help the hungry and destitute. When a violent earthquake hit Florence, he helped to rebuild the city, housing some of the victims in his own home. He died on May 2, 1459, and Pope Pius II himself came to attend his funeral. The people of Florence, who loved Antoninus, placed his statue in the Uffizi Palace, the city's hall of fame. Patron: Those with a fever. Symbols: Lily; pair of scales in which he weighs false merchandise against God's word; scales; wearing bishop's mitre, holding the cross, and giving the sign of blessing in absolution. Read a detailed life of St. Antoninus and see why he is a model for those in the workplace and marketplace. St. Antoninus was noted for his love of people: people of all kinds, from those in high places to the poorest of the city. To help the poor, he organized the Poor Men of St. Martin, who exist to this day. What have you done for the poor lately? During the reign of Julian the Apostate, Januarius, a priest, was brought before the judge, Gordian, that he might be condemned; but Gordian, after being instructed in the Christian faith by this same priest, was baptized by him at Rome, together with his wife and fifty three other members of his house. Whereupon the Prefect, having sent Januarius into exile, ordered his deputy Clementianus to imprison Gordian. The deputy, after some time, had Gordian led in chains before his tribunal, and sought to induce him to deny the faith. Failing in the attempt, the deputy ordered him to be first scourged with whips laden with plummets of lead, and then beheaded. His body was exposed before the temple of Apollo, that it might be devoured by dogs; but during the night the Christians took it, and buried it on the Latin Way, in the same crypt wherein had previously been laid the relics of the holy martyr Epimachus, brought from Alexandria, in which city he had endured a long imprisonment for the Christian faith, and was finally crowned with martyrdom by being burned to death.